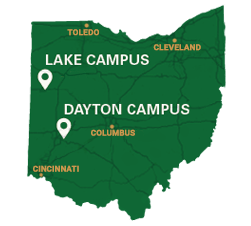 The Department of Communication at Wright State University welcomes you to share our passion and dedication to the field of communication. Communication is central to all activities whether in political communication, public affairs campaigns, or social media. Join more than 300 students who are earning degrees in communication studies and media studies. You may also be interested in minors in communication studies, media studies, and health communication. 2013 Wright State grad Chelsea Hall runs a growing photography business that specializes in wedding photography and portraits. Calandria Tate, who graduated from Wright State in December with a degree in communication studies, is volunteering in Senegal as a member of the Peace Corps. Students in Communicating Through Chronic Illness and End of Life course set up Wall to inspire others to think about what they want to do before they die. Wright State has hosted the District 6670 Rotary Club four-way speech competition since 2013. The exhibit gallery in the future Archives Center will be named the Linda Black-Kurek Family Foundation Exhibit Gallery where rotating exhibitions will showcase the depth of the collections. Finding the right college means finding the right fit. See all that the College of Liberal Arts has to offer by visiting campus.